Diess says VW is in "robust position" despite despite scandal. BERLIN -- Volkswagen Group posted a drop in first-quarter operating profit but optimism over its new chief executive and lower diesel emissions scandal provisions lifted its shares. Group earnings before interest and taxes declined 3.6 percent to 4.21 billion euros ($5.13 billion), VW said in a statement on Thursday. 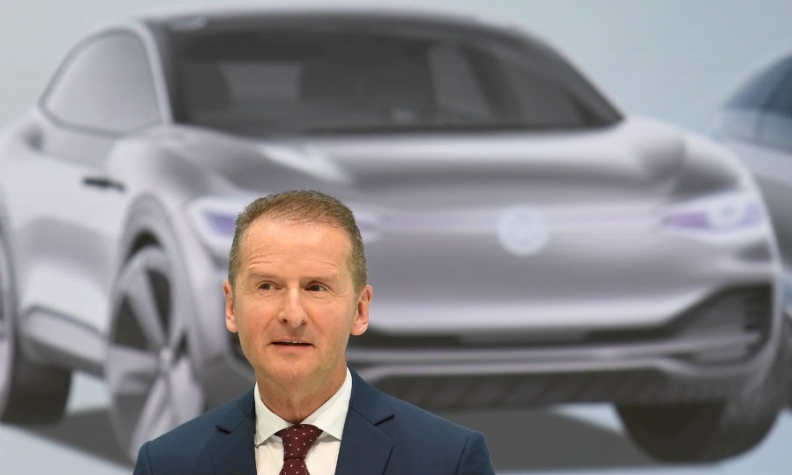 Two weeks after elevating brand chief Herbert Diess to group CEO as part of the biggest management shake-up in more than a decade, VW is shifting the focus to making its operating business more efficient. "The Volkswagen group is in a robust economic position. The quarterly results confirm that we are on the right path," Diess said in the statement. NordLB analyst Frank Schwope said the market is hoping for Diess to push further profitability gains. The risks from VW's diesel-rigging scandal are abating, he said. The diesel scandal has cost VW about $30 billion in fines and other costs. VW said negative effects from switching to the IFRS accounting standard had contributed to the profit drop, adding that underlying earnings slightly exceeded last year's 4.37 billion if the changes were excluded. The diesel scandal has prompted major changes at VW, which is reorganizing its multiple car brands and carving out truck operations while shouldering billions of investments in battery-powered and self-driving vehicles. The group set aside no more significant funds between January and March to cover fines, compensation and vehicle refits related to its 2015 emissions scandal, after it raised provisions by another 600 million euros in the fourth quarter to a total of 25.8 billion euros. VW shares were up 2.5 percent to 171.1 euros at 0824 GMT, outperforming Germany's benchmark DAX index. The carmaker stuck to its 2018 guidance published in February, predicting a return on sales of between 6.5 percent and 7.5 percent before special items, compared with 7.4 percent in 2017.